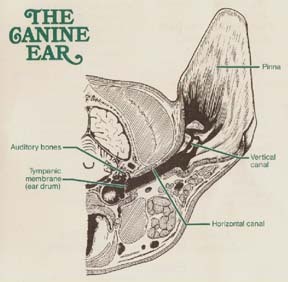 Certain breeds of dogs have special problems with their ears that tend to lead to the accumulation of wax and debris in the ear. This often leads to the development of ear infections that require treatment with antibiotics. When infections go untreated or occur repeatedly the body responds with inflammation. Since part of the problem that leads to the infection is a narrowed ear canal inflammation makes the problem worse. As the ears become inflamed the ear canal is narrowed making the likelihood of infection occurring greater. Cleaning the ear canal is usually accomplished using an ear cleaning solution. There are many schemes for doing this. One of the simplest solutions is modeled after the human pediatricians mixture commonly called "Swimmer's solution". We recommend a mixture of 1 part of white vinegar and 3 parts of rubbing alcohol. This mixture is best for animals without a tendency to form wax rapidly to clean mild accumulations and to dry ears after baths or swimming. It can be very irritating in an inflamed ear canal and does nothing to slow the accumulation of ear wax. The most common commercial mixtures contain an acidifier in a propylene glycol base. This mixture cleans and dries the ear, makes the environment poor for bacterial and fungal growth and propylene glycol acts on the sebaceous glands to reduce wax production. These products should be used regularly (about once a week) to be most effective. Any of our staff members can point out examples of these type of products. In general we have no particular preference for brand and tend to pick the one that "works for you". Other commercial mixtures include a "foaming" ear wash that is to be followed by a wash. These products are intended to be used as a pair. They work great to remove heavy accumulations of wax but you MUST use the rinse to carry away the wash which is very irritating if used alone. All of the washes are intended to be used in large volume. The ear canal is filled up with the wash and the base of the ear massaged to mobilize the debris. After massaging the dog is allowed to shake it's head and shake out the debris. Then a soft tissue is used to remove the excess from the outer ear. Repeat as needed. Ear washes are NOT used to treat infected ears. The infection needs to be eliminated before the wash is used to PREVENT recurrence of the infection. You will need to see your veterinarian to determine the best way to do this for the problem that your pet has. Ears that have infections are commonly have skin that is red and irratated. The debris from the ears commonly smells different than just the rancid fat smell of excessive wax production.